‘Tis the season of love. What better way to share love than with desserts? To honor the day where we pop vegan chocolate bon bons into our mouths, regardless of whether we bought them or someone else did, we’ve compiled some of our favorite vegan dessert recipes to whip up for Valentine’s Day. Who’s making what for us? Vegan Yack Attack’s food is one of our favorites, so of course we want gaga for this persimmon crème brûleé recipe by Jackie Sobon topped with sugared cranberries. The way to our hearts is via cookies. Add in the gluten-free deep dish variety courtesy of Strength & Sunshine and we’re totally sold. NBD, but this recipe is also paleo, allergy-free and sugar-free (sans the choco chips). Sneak veggies into dessert without anyone knowing! 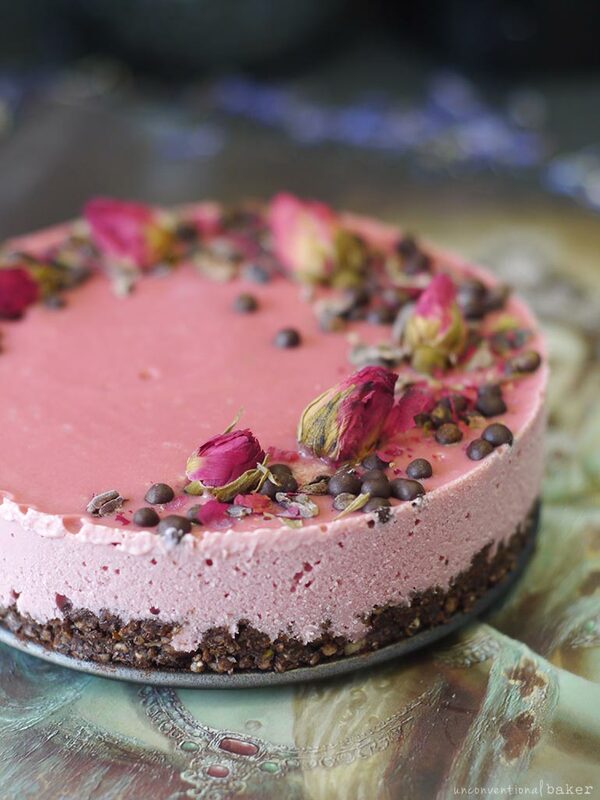 This raw chocolate beet cheesecake from the Unconventional Baker features beetroot powder to get its luscious pink color. The cashew-based cheesecake gets its sweetness courtesy of medjool dates and maple syrup. Spa Bettie has created chewy, sweet goodness with these raspberry dusted brownie truffles. This gluten-free treat taps into the powers of your blender and makes more than 20 bite-sized goodies. Get fancy and French for Valentine’s Day with the vegan version of pot de creme. From My Darling Vegan, this creamy pot de creme will have whomever you make this for saying oh la la. Hummus doesn’t have to be savory! The gluten-free brownie batter hummus from Pink Fortitude nixes chickpeas and replace them with cashews to create this creamy, sweet vegan dessert. Dessert can be healthy — and easy to make with That Girl Cooks Healthy’s cherry chocolate ice cream. Using a banana base, toss the ingredients into a blender and voila: ice cream. This isn’t your normal mousse. Animagus Eats chocolate mousse features whiskey, winter spices and more goodness in this rich vegan dessert. We’re way obsessed with our air fryer and had no clue you could use it to make a vegan dessert recipe like these small batch brownies by Veggies Save the Day. It Doesn’t Taste Like Chicken offers their vegan dessert recipe in the form of Red Velvet cheesecake bites. They’re beautiful, aren’t they? What a romantic menu of Valentine’s desserts. I can’t wait to try some of them!